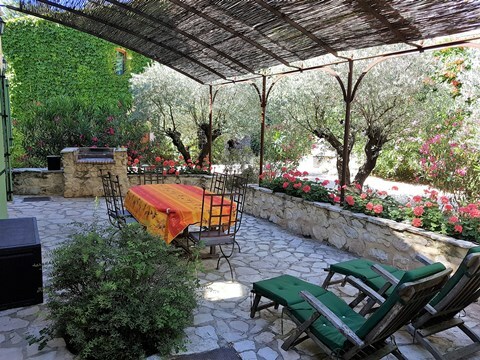 Located in the heart of Provence on the estate of Moulin de la Roque Noves is Mas des Oliviers, a charming three bedroom house cleverly built and restored from an historic building that once stored the grain for the mill. 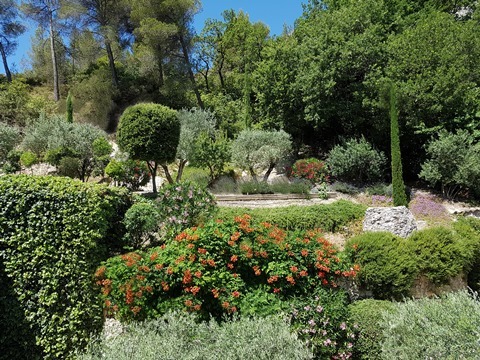 Mas des Oliviers is the perfect house for couples, families or just good friends. There are three air conditioned bedrooms and three ensuite baths for maximum comfort and privacy. 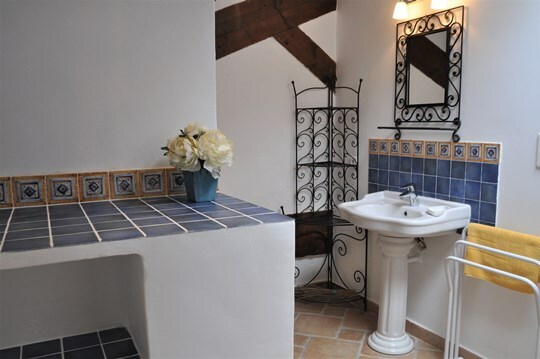 Provencal sunlight baths this house making it bright and cheerful. 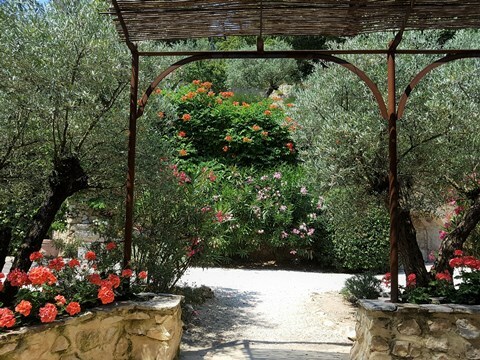 The courtyard just outside your door is stunningly beautiful surrounded by century old olive trees, lavender, Lauriel Rose, and many other flowering plants. A wall of geraniums completely surrounds the private terrace with teak table, chairs, parasol, lounge chairs and built-in barbecue. You will enjoy this covered terrace each evening with your friends or family while sipping a nice cool rosé . Entering this house from your terrace, you will find a cozy living space with exposed beamed ceilings, stone walls and old stone fireplace. Large windows and double glass French doors create a sunny and cheerful ambiance bringing nature to you. A nice dining area with oak table that can seat up to 10 persons, adjoins this living space and provides a nice view of the central garden. The fully equipped typical Provencal style kitchen is a cook’s dream, as it includes a large American central island and bar (an international touch). You have everything you need from five burner gas cooktop, convection oven, microwave, Nespresso machine, full size refrigerator / freezer and utensils galore. The kitchen is open to the dining and living area which makes cooking a social event! The living area is decorated in high quality Provencal fabrics, upholstered sofas and chairs, antique armoires and a large open stone fireplace built from stone of Les Baux de Provence. There is a large screen television with English channels, DVD player and stereo with CD player and MP3 connection so you can play your favorite music. It is surrounded by double French windows so you can let the air and the nature in when you wish or just enjoy the view. Also on the ground floor is a lovely bedroom with private access to the terrace through double French glass doors. 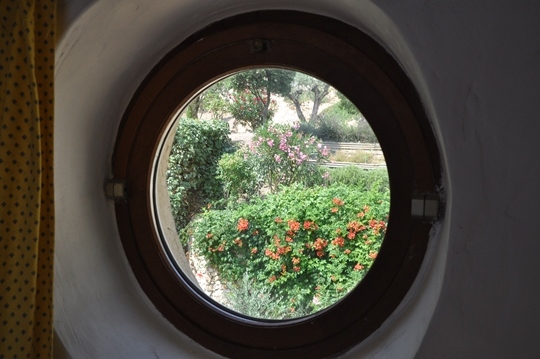 There is a an oversized skylight to bring in the Provencal sunlight but can be closed for late sleepers! This bedroom can be either king size or two twin beds, your choice. 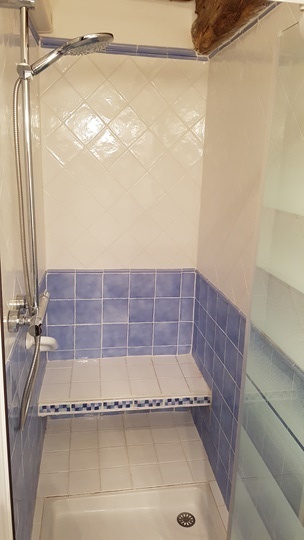 There is an ensuite shower with bench and sink and just adjacent a separate powder room with toilet and sink. This bedroom is especially nice for our elderly guests who may need to be on the ground floor and a shower with a low bench and hand railing for extra assistance. You reach the second floor up a gently winding stair case that was built around the original column that has supported this building for centuries. We couldn’t bear to cover it so incorporated it into the design of the house. On the second floor there are two large bedrooms and two ensuite baths. The first bedroom upstairs is spacious with beamed walls and ceilings, original to the building. There is an oversized skylight which brings in nice light during the day and brilliant stars in the evening. This bedroom can be either king size or two single beds and is large enough to add a third bed if needed (charges apply). 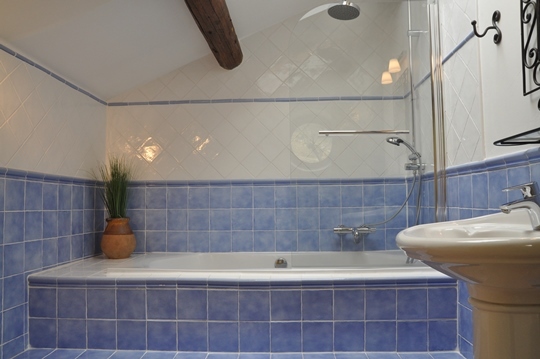 The adjacent bath, private to this bedroom includes a nice shower with bench, sink, toilet and washing machine. 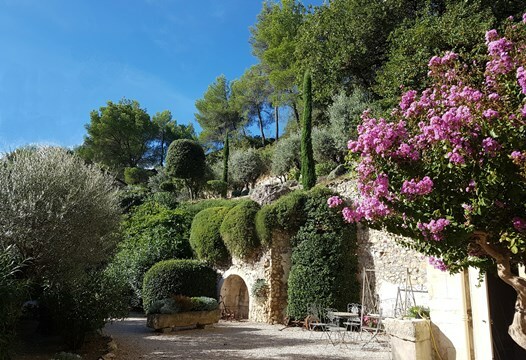 The master bedroom, just across the hall is stunning with double French windows gazing onto the upper olive tree and lavender gardens with beautiful views of the majestic flowering Bignone (Trumpet) vine that climbs the old stone walls to the forest. This bedroom is normally king size (1m80 by 2m) however can be two singles if needed. The ensuite bath includes a luxurious two person tub and shower, sink and armoire. 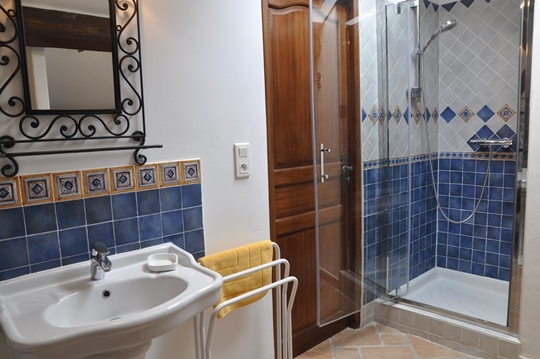 The toilet room is private to this bedroom and is set apart in a separate room from the bath. 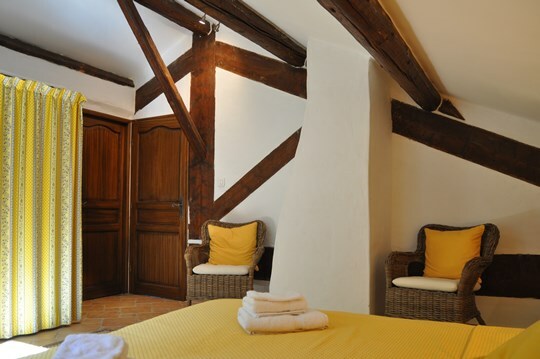 All the bedrooms are air conditioned and decorated in high quality Provencal fabrics. The walls are partially done in crisp white plaster, some walls in the orginal stone. Single beds (can be king upon request), bright, cheerful fabric, private entrance to terrace, air conditioning. Spacious with king bed, exposed beamed high ceilings, stone wall, beautiful view of olive trees, central courtyard garden, air conditioning. with two single beds (can be king upon request), exposed beamed high ceilings and walls, large skylight windows, air conditioning. 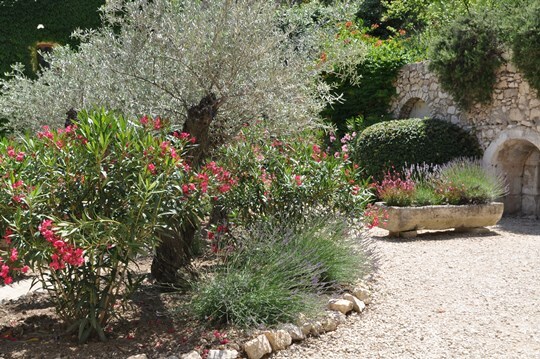 by olive trees and Provencal flowering plants (Oleander, lavender, rosemary). 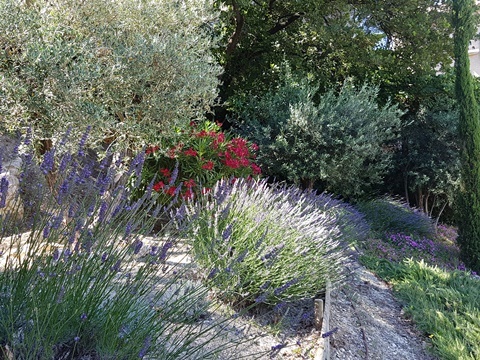 Magical Provence – your courtyard of Mas des Oliviers - entry from the north (Avignon) or from the south (St Remy de Provence) – both just 15 to 20 minutes away from your door. a lovely view from the terrace and the master bedroom windows. Typical and traditional Provencal décor with colorful,cheerful high quality fabrics, upholstered sofas and chairs, and an abundance of ambiance. An ancient stone fireplace from the stone of Les Baux de Provence will warm you in cooler months. 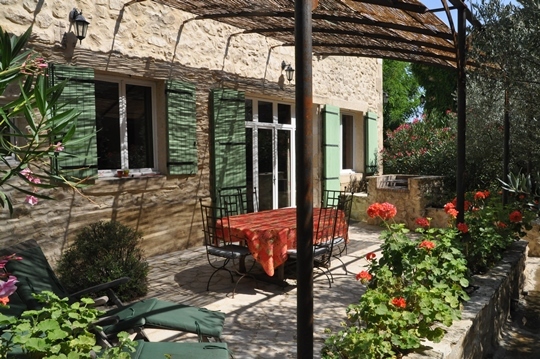 Large double French doors and windows bring the lovely nature of Provence to you. Oak dining table that can seat up to 10 persons if needed. 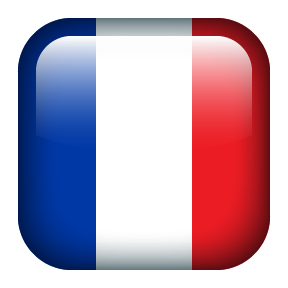 Modern appliances and utensils to create your best Provencal cuisine. A great mix of convenience, charm and history. Master bedroom, large with cheerful fabrics of Provence. King bed. 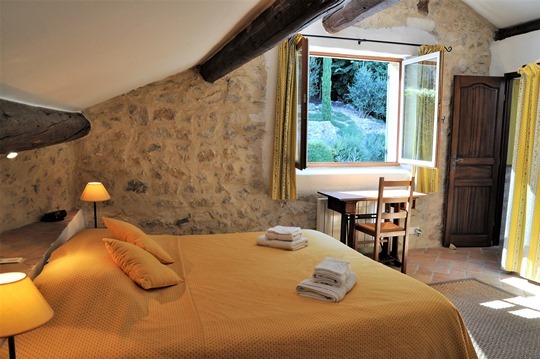 Original beamed ceilings and walls, oversized roof window brings the sky and light of Provence into your bedroom. Third bedroom with private access to courtyard and terrace. King bed or two twins. Beamed ceilings and private bath.